Little Blog In The Big Woods: Things could be worse. That makes the truck a flood loss, I assume, since it was driven into a flood and ruined. Maybe some flood aid will help replace it. I hope the repair place's insurance sees that the mowers get replaced fast or pays for getting the mowing done on the harvest schedule. Seems like agriculture may need to start working back toward plants that have extended ripening and harvesting timing, with the weather getting more variable, to spread the risk. Hmmm, isn't that how nature did it? Oh, Mother Nature, so cruel. Best wishes for a swift recovery of all. If I were closer, and not so many states away, I would most certainly be there, with my son, and helping to harvest! Insurance companies, though useful, are so expert at finding and exploiting loopholes. They make their money by _not_ paying out, yes? Please let us all know if there's any way we distant ones can help! Hank- well, the truck IS kind of a flood loss, but tangled up in a felony- you wanna guess how many hours I'd get to sit waiting for the next FEMA exec to figure that out? :-) while the bluejays and crows are are working as hard as they can? sigh. I'm so sorry for your challenges. I hope lots of good things are on their way to you. I'm sorry we can't help with the harvest, too. Best wishes to you and yours with help getting that harvest done. Greenpa, my hopes for a swift recovery. I saw a lot of the damage from the floods in Coffeyville, KS here just a couple weeks ago, so I know how much damage flood water can do. 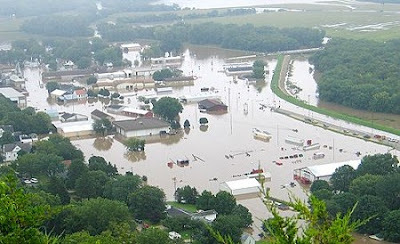 Of course, the flood there was made worse by many gallons of oil from the refinery, but still, it is devastating. I'm glad to hear that you will have a harvest at all. I'm sorry for your loss and will keep you in my thoughts and meditations. If you weren't 12 hours away (yes, I google mapped it) I would be there this weekend with my labor to help. I'm sorry all I can provide are well-wishes. Oh, yeah, could be a time sink; I figured you're entitled to register online, and by the time they get 'round to you it'll be much later than harvest time. Like get the ball to their court, then forget it. "Minnesota residents affected by the weekend’s flooding can register with FEMA online at www.fema.gov ..."
"loopholes" are like "potholes" under snow. Never seems to see them coming. Greenpa, good wishes for you on this. Just before I moved to NYC, a friend told me that about once a year, i would wake up and go out for the paper, and get hit by a bus while I watched them tow my car, wake up to find out my mother was in jail, walk barefoot to the Tombs to get her out, get mugged on the way, and find myself 48 hours later broke, shoeless, and without a paper :). It turned out to be true after a fashion. It sounds like this is the rural equivalent. But it seems to me that you're the guy who can muddle through such a thing. So I'm not a praying kind of person, but here's my best good wishes for you. Anyone want to audition for wife number two better talk to me ! As to the harvest and flood/ theft damage. . . I'm not sure what to do. Greenpa's trying to keep cheerful, but I can tell it's hard. He hasn't been able to spend as much time out in the field, so we're way behind. Add to the truck and flooded mowers, a sick wife. . . . Maybe he does need two wives! So all your best wishes are deeply appriciated. By greenpa and myself. Oddly, I feel better hearing that all is not perfect in Simple Life Land. I live there too, but in a different climate zone. I am glad that your crop is on the trees and not blown away as it would be in a storm in my yard. Dean almost got us last week. As I had mentioned before, so many other monetary obligations take us away from our designs on simplicity and often Nature undermines the plan too and we are left to look to the more complicated talents we have to bail ourselves out. Thankfully, we have some complicated talents! I'm glad you are bailing out the situation right there on Good Ol' Big Woods and that the birds are busy elsewhere. So hey, stop a while and eat a peach. Many of your problems are similar to the ones I have here, if you substitute crack for meth and drought and Sahara dust for flooding. I empathize with the struggle, but I think that after 30 years of doing what you are doing, you have the tricks figured out. The growing game is never all that easy but you seem to have a good crop, more than you can pick, and that is way better than the alternative. Hope the weather eases up for you soon. Q: What's the difference between an insurance company and a casino? A: When you win a bet in the casino, we pay it. RC- I do not envy you your hurricanes- they're looking particularly ugly these days. Yeah, it's time to move to higher ground- I remember your old old question. They're not going to go away. still; I'll see your hurricane, and raise you- 2 tornadoes, 4 severe thunderstorms (tennis ball hail), 4 cloudbursts, and a blizzard. I could never figure out why farmers come into the casino. I alaways ask them: "Don't you do enough gambling in everyday life?"